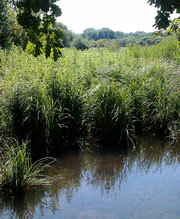 Oughtonhead Common is a Local Nature Reserve with a wide variety of wildlife habitats. The River Oughton flows alongside the common. Park seats are installed at various locations by the riverside making it a pleasant place to relax. The leaflet contains a guide to the wildlife that lives on the Common and includes a map of the river and popular walking routes. This reserve has been awarded a Green Flag for 2014/15. The Green Flag award scheme is the benchmark national standard for parks and green spaces in the UK. North Hertfordshire District Council has applied to the Secretary of State for Environment, Food and Rural Affairs for consent under section 38 of the Commons Act 2006 to carry out restricted works on Oughtonhead Common. The Planning Inspectorate will decide the application on behalf of the Secretary of State for Environment, Food and Rural Affairs. The proposed works are: Replacement and extension of the fencing of the grazed area. This will increase the current conservation-grazed grassland area from 6.2Ha to 9.8Ha, at a new length of 2,100m. Details can be found in the attached document. If you would like to be involved with the management and maintenance of this site, please visit the Countryside Management Service website or the Friends of Oughtonhead Common.